Wall Street shares have ended higher, buoyed by the news that China made an trade offer to the US that could resolve the trade war dispute. The S&P 500 finished 1.19% higher at 2,667.38. And finally, the tech-heavy Nasdaq ended 1.03% ahead to 7,157.23. The UK Airprox Board (UKAB) said the "highest risk of collision" occurred when a large "commercial drone" was seen to pass within 20 metres of an Airbus A380 as it approached Heathrow. International trade secretary says other countries must "put the work in" ahead of possible no-deal Brexit. In Chile, lawmakers have been trying to regulate the fishing of cuttlefish - a large type of squid. Fishermen are only allowed to catch the squids using jigging gear and handlines, not fishing trawlers. If the rules are broken, perpetrators face fines of up to 25 million Chilean pesos ($37,263, £28,943). This has been met by a huge amount of opposition from fishermen, to the extent that the city of Concepcion in the south has seen nine days so far of violent riots. The fishing industry is responsible for 8,500 jobs and catches about 40,000 tonnes of fish annually, according to Chliean national newspaper La Tercera. US prison staff face real economic hardship thanks to the partial shutdown of the federal government, and that may pose a threat to the security of the country's jails. Eric Young is a prison officer and a national labour union representative for the American Federation of Government Employees. He tells the BBC's Vishala Sri-Pathma how not getting paid is affecting him and his colleagues. And he speaks of his fears for the peace and integrity of prisons. Facebook shares lost most of their gains on Friday, dropping to $148.68, after sources told the Washington Post that the Federal Trade Commission is considering levying a record-breaking fine against the social networking giant. The fine concerns user data privacy violations, tied to the FTC's investigation into Cambridge Analytica. Facebook shares are now up 0.9% to $149.62. HM Revenue and Customs has released a list of the strangest expense claims and excuses it has received from people who haven't filed their tax returns. Sadly, HMRC says that all of these excuses and expense claims were unsuccessful. 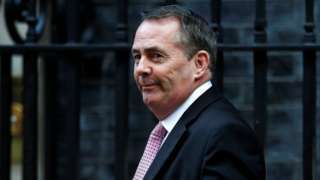 International Trade Secretary Liam Fox said he "hoped" they would but it depended on whether other countries were "willing to put the work in". He said more deals were coming, after signing one with Australia. Concerns have been raised that the UK will leave the EU without a deal that would protect current arrangements. Lloyds Banking Group has told the BBC that faster payments should now be working again for Lloyds Bank, Halifax and Bank of Scotland. “Faster Payments are now being processed, however due to the issues experienced today there may be a delay in processing some of the payments that customers made earlier in the day," said a spokesperson. "We continue to advise customers that they should not submit a second payment, to avoid duplicate payments being processed. Reality Check verdict:Current research suggests there was a small, negative impact on the wages of low-skilled workers, which was outweighed by other factors such as the impact of the financial crisis and rises in the minimum wage. London shares have ended higher, as the FTSE jumped on hopes that the US-China trade war could soon be resolved, thanks to China's trade offer to the US. The FTSE 100 closed 133.4 points or 2% up to 6,968.33. Top of the winners was Ashtead Group, rising 4.5% to £19.53 after RBC Capital Markets reaffirmed its "outperform" rating on the stock. The FTSE 250 ended 227.2 points or 1.2% ahead to 18,764.47. Metro Bank led the winners, jumping 5.9% to £21.96. Customers of Lloyds Banking Group, which owns Lloyds Bank, Halifax and Bank of Scotland, have been experiencing problems receiving faster payments using online banking since about 11:00 GMT on Friday, due to an ongoing IT outage. “We are aware that some of our customers are experiencing problems with making Faster Payments," said a spokesperson. US consumer confidence has fallen to its lowest since October 2016. According to the University of Michigan's consumer sentiment survey consumer confidence fell to 90.7 in January, down from 98.3 in December. Consumers are concerned about volatile markets, global economic slowdown, President Donald Trump's trade tariffs, and the partial shutdown of the federal government. “Aside from the direct economic impact from these various issues on the economy, the indirect effect meant that half of all consumers believed that these events would have a negative impact on Trump’s ability to focus on economic growth,” said the Surveys of Consumers' chief economist Richard Curtin. "While the January falloff in optimism is certainly consistent with a slowdown in the pace of growth, it does not yet indicate the start of a sustained downturn in economic activity." 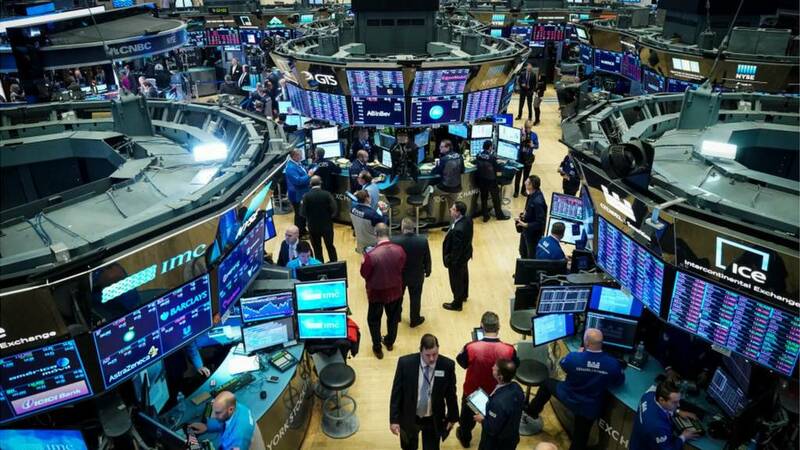 Wall Street shares have risen again, amid news reports that China has offered to increase its annual import of US goods by over $1tn over the next six years. Both Bloomberg and CNBC are reporting the news, which was told to them by US officials. The offer was made earlier this month during trade talks between the two countries. In 2018, the US trade deficit with China was $323bn. This deal would aim to reduce that annual trade difference to $0 by 2024. The Dow Jones Industrial Average is now 360.6 points or 1.5% higher to 24,567.77, the S&P 500 is 20.4 points or 0.8% up to 2,656.34, and the tech-heavy Nasdaq is 62.3 points or 0.9% higher to 7,146.71. John Williams, president for the US Federal Reserve's New York region, has told the audience at a conference on Friday that the Federal Reserve is taking the approach of "prudence, patience, and good judgment" when deciding whether to raise interest rates. In 2018, the Fed raised rates four times, each by a quarter point. Mr Williams' comments seem to echo comments by his colleagues signalling that the Fed will be cautious about further hiking rates in 2019. He also said that he expects the US economy to grow by between 2 and 2.5% this year. "That's a step down from 2018, but still consistent with a healthy, growing economy," he added.